You can use Visual Studio to reduce risks and increase the productivity of your application lifecycle. You can use the features provided in this release to perform new tasks that benefit a variety of roles on a product development team. Debug an application faster with IntelliTrace, which is available in Microsoft Visual Studio Ultimate only. Collect and analyze concurrency performance data that includes resource contentions in multi-threaded applications, thread activity on multi-core computers, the state of individual threads over time, thread migration, and other information that uses the Profiling Tools. Bridge the collaboration gap between the Project Management Office and software development teams. By installing SP1 and the feature pack for Team Foundation Server and Project Server integration, each team can manage and track the data that interests them. Add and update global fields for a team project or team project collection by using global workflow. Sort tree lists both in the query results window and in Microsoft Excel. Unblock the data warehouse from processing due to schema conflicts. Modeling the Application: Display linked layer elements in work items. To enable bidirectional linking between work items and model elements, you must have the Microsoft Visual Studio 2010 Visualization and Modeling Feature Pack or Microsoft Visual Studio 2010 Feature Pack 2 installed. The debugger now supports Internet Information Services (IIS) Express. IntelliTrace now supports 64-bit debugging. IntelliTrace now supports Workflow and projects that use Web Parts controls. By default, IntelliTrace no longer saves IntelliTrace log files (.iTrace files) after you close Visual Studio. You can change the default behavior to enable IntelliTrace to save all log files, or you can manually save IntelliTrace log files, as described in the Saving Log Files section of Collecting IntelliTrace Information. SP1 for Visual Studio 2010 adds the following basic support for unit tests that target the .NET Framework 3.5. As a result, you can now test applications that you have created with SharePoint 2010 Products. You can create unit test projects and target them to the .NET Framework 3.5. You can run unit tests that target the .NET Framework 3.5 from SP1 for Visual Studio 2010 on your local machine. You can run unit tests that target the .NET Framework 3.5 by using MSTest.exe at a command prompt. You can run unit tests on a build agent as part of a build. The default target version of the .NET Framework in test projects is the .NET Framework 4. If you upgrade test projects from Visual Studio 2008, they are upgraded to target the .NET Framework 4 by default. You can edit the project properties and explicitly re-target the project to the .NET Framework 3.5. In the .NET Framework 3.5, multi-targeting is supported for test projects that contain only unit tests. The .NET Framework 3.5 does not support any other test type, such as coded UI or load test. The re-targeting is blocked for test types other than unit tests. Execution of .NET Framework 3.5 tests is supported only in the default host adapter. It is not supported in the ASP.NET host adapter. ASP.NET applications that have to run in the ASP.NET Development Server context must be compatible with the .NET Framework 4. Data collection support is disabled when you run tests that support .NET Framework 3.5 multi-targeting. You can run code coverage by using the command-line tools in Visual Studio. Unit tests that use the .NET Framework 3.5 cannot run on a remote machine. Coded UI tests now support Windows Internet Explorer 9 with some limitations. In the summary in the build results window, no more than five of the following types of messages appear: errors, warnings, static analysis errors, and static analysis warnings. If more than five of these messages were logged, you can click a link to display them in the MSBuild log file. In the log in the build results window, no more than 50 of the following types of messages appear: errors, warnings, static analysis errors, and static analysis warnings. If more than 50 of these messages were logged, you can click a link to see them in the MSBuild log file. For more information, see the Microsoft Web site: Visual Studio Developer Center. Visual Studio Team System Database Edition: The features that were formerly released as Visual Studio Team System 2008 Database Edition are now included as part of Visual Studio Professional, Microsoft Visual Studio Premium, and Visual Studio Ultimate. Visual Studio Team Explorer: The client application installs with each product in Visual Studio. For more information, see the Microsoft Web site: Installation Guide for Team Foundation. Streamlined Installation: You can install on client operating systems by using an included version of SQL Server Express. Flexible Installation Options: You can choose whether to use SharePoint Products or the reporting feature. Team Web Access: Team Web Access is automatically installed and configured when you install Team Foundation Server. Manage your product backlog and plan iterations with the Excel workbooks that are defined for planning with the MSF for Agile Software Development v5.0 process template. You can use these workbooks to help load balance your team and track progress toward completing project iterations. Track code defects and test coverage with increased integration of work item tracking with Test Manager and Test Runner. This integration includes the implementation of new types of work items such as test case and shared steps and associated link types that are defined for the MSF process templates. Better Integration of Team Web Access with Team Foundation Server: Create and update work items; create relationships among work items; view dashboards, reports, and build status; and accomplish most tasks supported by Team Explorer using Team Web Access. MSF for Agile Software Development v5.0: The most recent version of the process template for agile software development provides a new set of work item types, link types, reports, and documents to better align with how agile teams work. For increased visibility into the progress of the project, built-in dashboards show if the bug count is growing or shrinking, and the rate at which bugs are being fixed, created, and closed. MSF for Capability Maturity Model Integration (CMMI) Process Improvement v5.0: The most recent version of the process template for CMMI provides an updated set of work item types, reports, and dashboards to support teams that are focused on process improvement work. Organize and Manage Access to Team Queries: Create team queries and nested hierarchies of subfolders to contain team queries, and specify access permissions to each. Customizable, Role-based, Out-of-the-box Dashboards: Quickly find important information about your assignments, status of your project, software quality, test progress, and build quality with one of the out-of-the-box dashboards. These dashboards are defined for MSF process templates and use features available with SharePoint Products. New and Improved Reports: View and track progress using one of the many out-of-the-box reports. Some of the reports provided include bug status and bug trends, build quality indicators and build summary, burndown and velocity, reactivations, remaining work, stories overview and progress, and test case readiness and test plan progress. These reports are defined for the MSF process templates. Warehouse Database Views: Easily create Transact-SQL queries for your reports using the new views for the warehouse database. Unlike the tables on which they are based, these views are designed so that you can use them in reports, and they are less likely to change in new releases. Generated Excel Reports from Work Item Queries: Quickly create simple visual reports based on a work item query. This feature analyzes the query and creates reports in Microsoft Excel that are connected to the SQL Server Analysis Services database. Link filter: Control the set of link types that can be used to link types of work items. Also, you can specify the default column fields displayed for links in a work item form. Hyperlink label: Attach a hyperlink to informational text or to a field label. Standalone label: Provide informational text that is not associated with any field. Optionally, you can attach a hyperlink to some or all of the text. Web content: Display content from a URI or HTML-based content within a work item form. Optionally, you can apply conditional actions based on the value of another field. Generate dependency graphs from source code in a Visual Studio solution or compiled code to visualize relationships and functional areas of the code. Visual Studio Premium supports read-only versions of these graphs. Use Architecture Explorer to explore relationships in the code and focus on areas of interest. Generate sequence diagrams from code to see interactions between instances. Communicate changes in the design by editing the diagrams. Create layer diagrams from code to visualize or define the logical architecture of your system. Organize classes, namespaces, code files, projects, and other artifacts in your Visual Studio solution into logical layers and describe their existing or intended dependencies. Validate code against layer diagrams to enforce architectural constraints. Include layer validation as part of the check-in and build process so that you can find conflicts early and regularly. Model user requirements and describe the design of your system by using UML diagrams. Visual Studio Ultimate supports the following types of UML diagrams up to the UML 2.1.2 specification: activity, component, class, sequence, and use case. Visual Studio Premium supports these diagrams in read-only mode. Integration of Model Elements with Work Items in Team Foundation Server: Organize the tasks for updating your system by creating and linking work items with model elements. This mapping creates a strong relationship between the parts of your system that are under development and the requirements they must meet. Customize model and diagram elements with profiles and stereotypes. Validate UML models against constraints that are customized for your application. Generate code and other artifacts from models. Add menu commands and gesture handlers to UML diagrams, which can update the model and generate files. Package and distribute these extensions in a Visual Studio Extension (VSIX). View Actionable Diagram of Merges: Starting from a file, changeset, branch, or work item, you can quickly retrieve a diagram that displays each merge of a changeset. You can see both where and when the merge occurred. You can also use the diagram to perform common tasks. For example, you can merge a changeset by dragging the changeset to a branch where the changeset is required. View Actionable Diagram of Your Branch Hierarchy: This diagram can help your team members understand your team project's branch hierarchy, get detailed information about each branch, and initiate typical actions such as merges. Resolving File Conflicts in the Pending Changes Window: The Pending Changes window enables you to more quickly and easily resolve file conflicts. View Merges in a File's History: When viewing the history of a file, you can see detailed information about each merge that caused changes to the file. This information includes the branch from which the merge came and the date and time of the merge. You can also drill down and view details about the changeset in which the changes were made. Manage Labels: The new Label window gives you tools that make it easier to apply, edit, remove, and manage your labels. Rollback: You can use the tf rollback command to eliminate the affect of one or more changesets on an item. The features that formerly released as Team System 2008 Database Edition are now included as part of Visual Studio, Visual Studio Premium, and Visual Studio Ultimate. Debug code faster with IntelliTrace: IntelliTrace, available in Visual Studio Ultimate, improves debugging productivity by reducing the time that is required to reproduce and diagnose an error in your code. Unlike the standard debugger, which shows the state of the system at a point in time, IntelliTrace captures and records what the application does over time. When an error occurs, you can view the state of the system at any time from the start to the point of the error. Additionally, because testers can record a historical debugging session in the environment in which a bug occurred, IntelliTrace reduces the chance of not being able to reproduce a bug. Manage Database Change: The features that formerly released as Visual Studio Team System 2008 Database Edition are now included as part of Visual Studio, Visual Studio Premium, and Visual Studio Ultimate. As a result, you can apply the same life-cycle tools to your database code that you apply to your application code. Specific information about other database providers will be announced on the Microsoft Web site when those providers become available. These providers are not included with Visual Studio and must be installed separately. Support Database Schema Providers From Other Companies: You can add database providers from other companies to manage changes to database servers other than SQL Server. The specific feature extensions depend on the database providers. For example, other database providers might support different types of database refactoring operations. Improve Code Quality With Code Analysis Tools: Focus on your critical quality goals by using managed code rule sets to organize code analysis rules and check-in policies. Keep Tests Up-To-Date with Test Impact Analysis: You can see a list of both manual and unit tests that are affected by your target code changes by using Test Impact Analysis. As you run those tests, the test list adjusts to show only the remaining tests. Additional code changes adjust the list of unit tests, as do tests that are running on the server. You can also predict many potential check-in problems that would otherwise have gone into your build and remained undetected. Profile thread and process concurrency behavior by using new profiling modes that provide resource contention and thread interaction data for multi-processor computers and multi-threaded applications. Remotely Debug Message Passing Interface (MPI) Applications that are Running on a Windows HPC Cluster: You can use the MPI Cluster Debugger to simplify debugging multiple cooperating processes that are running on a remote cluster. By using the MPI Cluster Debugger, you can easily deploy required files to the cluster nodes, open the remote debugger on each cluster node, and clean up after the debugging session has ended. For testers, there are many new features in Visual Studio 2010. You can now plan your testing effort. 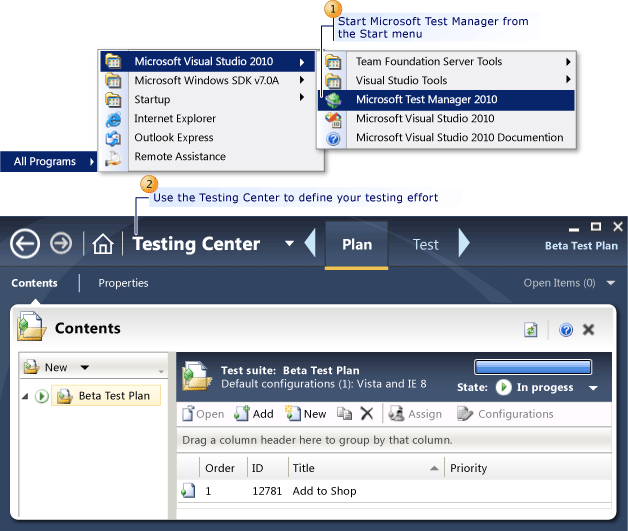 This includes creating test plans, test suites, test configurations, and test cases with individual test steps using the new application for testers called Microsoft Test Manager as shown in the following illustration. These artifacts are now part of your team project. The tester benefits from being able to gather diagnostic information when you run tests and automatically adding this information to a bug. The tester can collect details of the actions that are performed when you run a manual test case. These details can be used the next time to fast forward manual testing. Visual Studio Test Professional: This is primarily for the generalist tester who wants to create manual test cases, run these and view the results as part of a test plan. This product includes the new application called Microsoft Test Manager. This product can be installed quickly and easily on the test machine where the tester wants to run their tests. You can also run automated tests from Microsoft Test Manager if an automated test is associated with a test case using functionality in one of the following two products. Visual Studio 2010 is not provided as part of Test Professional. Visual Studio 2010 Premium: By using this product, users can create unit tests and UI automated tests for an application. The tests that are created can be run from Microsoft Visual Studio 2010, run at a command prompt, run from Team Foundation Build, or associated with a test case and run from a test plan by using Microsoft Test Manager. Microsoft Test Manager is not part of Visual Studio 2010 Premium. Visual Studio 2010 Ultimate: This product contains all the test functionality in Visual Studio 2010. It includes Microsoft Test Manager, which provides the functionality for planning, creating, and running test cases. Users can also create and run unit tests, UI automated tests, load tests and Web performance tests, generic tests, and ordered tests by using Microsoft Visual Studio 2010. These automated tests can be run from Microsoft Visual Studio 2010, run at a command prompt, run from Team Foundation Build, or associated with a test case and run from a test plan by using Microsoft Test Manager. If you want to run load tests and simulate multiple users, you must also purchase a virtual user license. Define Your Testing Effort: You can easily define your testing effort for a specific iteration in your project and measure your progress by using a new application for testers, which is called Test Manager. You can create test plans, test suites, test configurations and test cases to define the testing required. Create and Run Manual Tests: You can create manual test cases that contain individual test steps by using Test Manager. Each test step includes an action to perform and can specify an expected result. You can run these tests and mark each step as passed or failed as you perform the actions on your application under test. You can also create shared steps that are common to multiple test cases, in order to reduce the time that is required to create test steps, in addition to the ongoing maintenance costs. Record Manual Test Steps for Playback: You can create recordings of actions you perform for a manual test case. You can play back this recording to quickly fast forward through steps in a test to verify a bug has been fixed. Create Automated UI Tests: You can create automated UI tests, known as coded UI tests. You can import recorded actions and generate code that represents your UI controls, or you can locate your UI controls and perform actions on them. You can then add validation code to check that your application under test is working correctly. You must also install test agents and test controllers, which are available from Microsoft Visual Studio Agents 2010. For the virtual machines that you create with Lab Management, you must install lab agents, test agents, build agents, and test controllers as required from Microsoft Visual Studio Agents 2010. Create Physical or Virtual Test Environments To Use To Deploy Your Application or Run Your Tests: You can create physical or virtual environments that contain the set of roles that are required to run a specific application and the machines that you can use for each role. Collect Diagnostic Data or Affect Your Test Machine and Easily Add Collected Data to a Bug: When you run a manual test with Test Runner, you can now make a video recording of the test case, or record the actions to a log file. You can add comments, and files such as screenshots when you run the test. In addition, for tests on applications which are in virtual environments, you can take snapshots of the environment and attach them to the bug. When you run tests you can also collect diagnostic trace data (called Intellitrace data), code coverage data, or test impact analysis data. You can have your computer emulate a specific network, or you can create your own custom data diagnostic adapter. If a test fails, you can create a bug by using Test Runner. This bug is automatically populated with the data that you collected, so that a developer can find all the information that is required to fix the bug. Group Your Automated Tests By Using Test Categories: You can now group your automated tests using test categories, which are more flexible than test lists. Increased Flexibility to Customize, Change, and Scale Out Your Build System: Whether your organization is a small startup with simple needs or a large and complex enterprise, you can design a build system topology to meet your needs today. As your code base expands and your team grows, you can quickly and easily scale your build system out one build machine (either physical or virtual) at a time. Additional flexibility in Team Foundation Build means increased productivity for your software developers and testers. For example, build agents can be pooled and shared across an entire team project collection to ensure an efficient use of your build system hardware resources. Pools of build agents are managed by a new entity known as a build controller. No longer does a queued build need to be stalled waiting for a single build agent to become available. The build controller delegates work to an available build agent that meets those requirements. Easy to Create and Modify Build Definitions: You can use the Default Template to quickly define a build definition that performs the most common build tasks such as compiling code, running tests, and dropping the binaries. You can later go back and modify the build definition by using the same simple user interface. Create a Custom Build Process Using Windows Workflow Designer: You can create a richly customized build process by using the Windows Workflow Designer. Build definitions that were created by using Visual Studio Team System 2008 Team Foundation Server. Build types that were created by using Visual Studio 2005 Team Foundation Server. Gated Check-in and Private Builds: Build breaks can prevent your team from making progress while you diagnose and correct the problem. You can define a gated check-in build definition to protect some or all of your codebase against build breaks. When gated check-in is enabled, changes that affect your build are automatically shelved and a build of that shelveset is queued. The changes will only be committed to version control if the build succeeds. Your developers can also queue a private build of their code changes before trying to check them in. Publish Data to Symbol Server: You can configure your build definition to publish symbols data to enable features such as Intellitrace. In many cases, errors are displayed as hyperlinks which you can click to view the file. Inside the report you can click a link or select a menu item to open the drop folder, rate the build quality, and even delete the build. In a graph of recently run builds of the same build definition, for each build you can view results such as, build run time and build success or failure. You can also click a bar in the graph to open the report for that completed build. Visual Studio Lab Management enables you to create, assign, and track virtual environments to use in your virtual lab. The environments can be used for application development, deployment, and testing. Create Multi-tiered Environments for Developing and Staging Your Application: You can quickly create virtual environments that contain multiple virtual machines for running unit tests when you code an application or functional tests when you test it. You create these environments from clean virtual machines and templates that specify the role for which each virtual machine is used in your virtual environment. This reduces the time that you must spend to set up machines and increases the time that you can spend testing. You can also create copies of environments without name conflicts by using network isolation. Automatically Deploy Applications to Virtual Environments: You can use Windows workflow to automatically deploy new builds of your application to virtual machines and then run verification tests. Use Virtual Environments When Filing Bugs and Reproducing Bugs In Your Application: Testers can run tests on virtual environments, and, when they discover a difficult problem, attach snapshots of the environment to the bug. Developers can then connect to the snapshot of the environment where the bug was found to more easily reproduce it. Team Foundation Administration Console: You can review the status of the servers that host the application services and configuration database, add or remove SharePoint Web applications for hosting team project portals, and manage team project collections. SharePoint Web Applications: You can use more than one SharePoint Web application for hosting the Web sites used as team project portals. Project Collections: You can group projects that have similar needs or objectives, or that share common user groups, server resources, and maintenance schedule. Add Servers to Existing Deployments: You can use more than one server that is running SQL Server for hosting the databases for your deployment. If you have a network load balancer (NLB) installed and configured in your deployment, you can add more application-tier servers to transparently balance the load between servers in large-scale deployments. Automatic Update of Work Item Fields that Store Person Names: You can update the name of a team member in Active Directory, and the change is automatically updated in the corresponding work item fields at the next synchronization. Automatic propagation of name changes is made to work items, work item histories, queries, and alert notifications. Added information about what’s new in Service Pack 1.